Saylor Slone Martine: Another “accidental” child shooting death shows that child shooting deaths are not accidental. 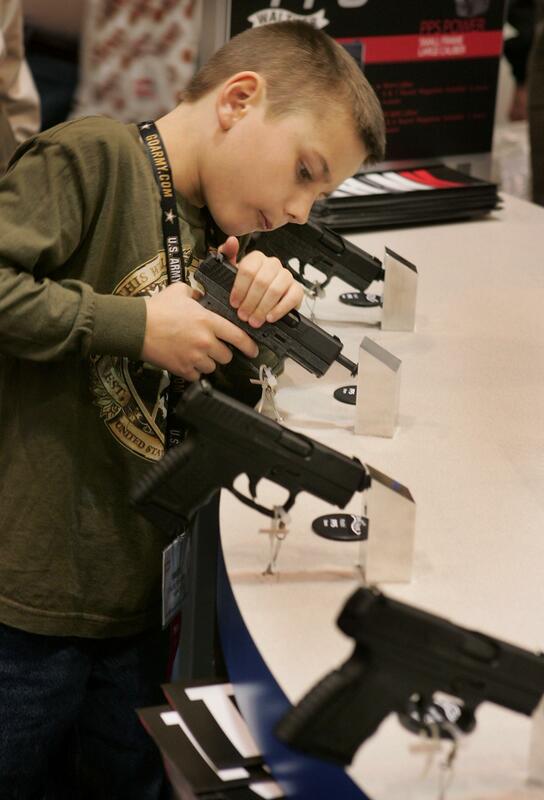 Eight-year-old Dakota Stevenson looks over Walthers pistols at the Smith & Wesson booth during the 136th NRA Annual Meetings and Exhibits in St. Louis, Mo. Last Sunday, 15-year-old Saylor Slone Martine died after she was shot in the head with a semi-automatic handgun that belonged to her parents. (The Poteau, Okla. Daily News says Martine’s mother had recently purchased the gun for “personal protection.”) Martine and her 12-year-old sister had been handling the gun when they laid it down on a counter, where it “suddenly discharged,” according to the Times Record. Martine died in the hospital. The sheriff speculated that the incident might have been caused by a “production defect” with the handgun. Just another one of those sad, tragic accidents. There may well be more to this story, because handguns typically don’t just accidentally discharge, especially if they’re just sitting on a counter. It happens, but rarely. But that’s not my main point. As sick as I am of seeing these sorts of stories—and I see a lot of them—I’m even more sick of seeing them characterized as unforeseeable, unpredictable accidents. The incidents themselves might be random, but there is nothing random about the circumstances behind them. Children die in accidental shootings because inattentive parents leave their guns lying around, with ammunition chambered, in unsecured places where untrained shooters can access them. They step outside when their children are handling their guns, just like Saylor Martine’s mother did. They understand little about gun safety, and they pass that ignorance on to their children. These shootings are a direct result of a cavalier approach to gun safety—and of the inconsistency and inadequacy of the laws that are supposed to motivate people to take gun safety more seriously. According to the Law Center to Prevent Gun Violence, only 27 states (plus Washington, D.C.) have child access prevention laws on the books, and those laws vary widely in scope and strength. (Though Oklahoma does have child access prevention laws, they wouldn’t apply in this case, because parents can only be held liable for giving children access to guns when they do so knowing it is likely that their children will use those guns to commit a crime.) This is ridiculous. Every state ought to have these laws on the books, and they ought to be standardized, strengthened, and rigorously enforced. I can’t imagine the grief Saylor Martine’s parents are feeling right now, and it seems a bit cold to suggest that they should be fined or prosecuted. But doing so may well prevent the next accident by persuading other parents to unload their damn guns, and lock them up where their children can’t get to them. When it comes to gun safety, ignorance is negligence, and negligence is too often fatal. Saylor Martine gets shot in the head while stooping down to pick up her cell phone. A five-year-old Kentucky boy accidentally shoots and kills his two-year-old sister with a rifle that his parents stored “in a corner.” A six-year-old New Jersey boy accidentally shoots and kills his four-year-old neighbor with a rifle he allegedly found hidden under a bed. There are many, many others. I’m going to keep covering these stories. Attention needs to be paid to this problem in order to convince people that there is a problem, and not just a series of isolated incidents. But I need your help. If you see a story about a child who dies in an accidental shooting, please email me. These incidents can be reduced if we just start paying attention.